SEOUL, April 17 (Yonhap) -- South Gyeongsang Province Gov. Kim Kyoung-soo was released Wednesday after 77 days of detention over his role in a massive rigging of online opinions. The Seoul High Court approved Kim's request for bail but attached a condition under which he should only stay in his residence in Changwon, 400 kilometers south of Seoul. Kim, known as a confidant of President Moon Jae-in, was sentenced to two years in prison in January for colluding with a power blogger to carry out an illicit cyber operation to sway public opinion in favor of Moon ahead of the 2017 presidential election. "(I) will prove once and for all that truth will come around no matter how far it is thrown away," he told reporters. "(I) will reveal the truth through an appeals trial." Kim, 51, earlier requested the bail on the grounds that the provincial government suffered a setback in doing its work due to his absence. For the 200 million-won (US$176,025) bail, the court ordered him to pay half of the amount in cash. Kim received the two-year jail term for collusion with the power blogger, better known by his nickname, Druking, to artificially jack up the number of likes of Internet comments on sensitive political news to benefit the ruling Democratic Party (DP), the then main opposition party, and its presidential candidate Moon ahead of the 2017 elections. Moon won the snap election in May, replacing former President Park Geun-hye, who was ousted from office in March 2017 over a corruption scandal. In a separate case of violating the election law, Kim was sentenced to 10 months, suspended for two years. Under Wednesday's decision, Kim should not meet or contact witnesses or any people in connection with his trial and legal cases involving Druking and his aides. As long as he does not leave his residence for long, the governor will be able to go to his office for work. Rival political parties showed a mixed reaction to the court decision. The ruling DP said it respects the decision, vowing efforts to uncover the truth behind his case. "We will make efforts to help the South Gyeongsang provincial government swiftly normalize its operation and boost the regional economy," said Rep. Lee Jae-jung, a DP spokeswoman. But the main opposition Liberty Korea Party (LKP) denounced the decision, raising the need to appoint the special counsel again to look into the allegations. 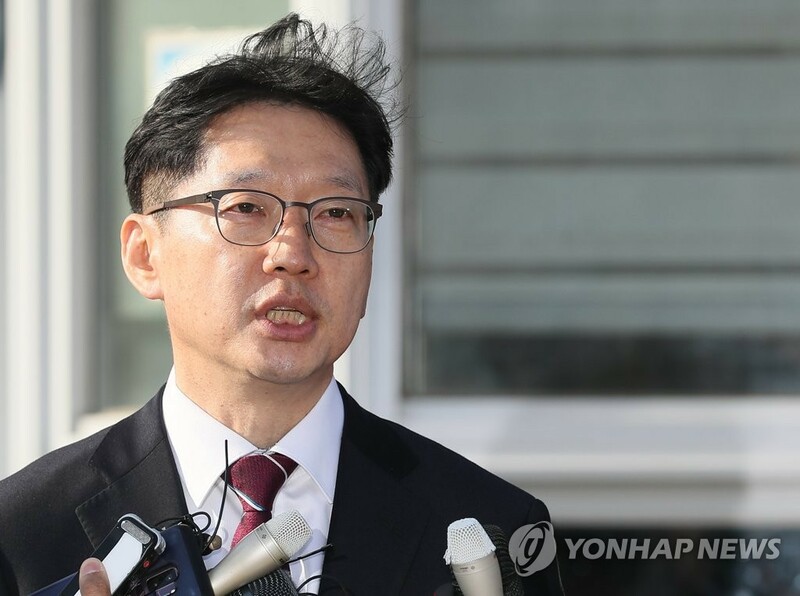 "Effectively, (the judiciary) gave up (a will to proceed with) a fair trial," said Rep. Jun Hee-kyung, an LKP spokeswoman.